Cook the asparagus in salted, boiling water for fifteen minutes. 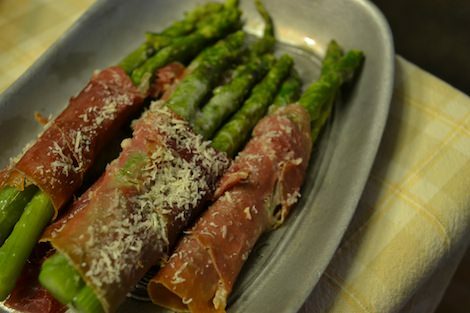 Spread out the prosciutto on the counter, lay two large or three small asparagus on each slice, roll up and fasten each roll with a toothpick. Place the rolls in the prepared dish, sprinkle with the parmesan, dot with butter and bake for 10 minutes. Florence Mim's shares, "These rolls were made by my grandmother. I have seen similar recipes but always come back to this one. It is a delicious recipe for asparagus rolls." And I love that Florence recognizes that there are other recipes like this. It fits into my notion of similar yet different! For Florence, like many of us, we have our memories as our heirloom - it gives wonderful context to a recipe. Thank you for sharing Florence!! If you like your asparagus more on the al dente side - cook the asparagus for 5 minutes or less.